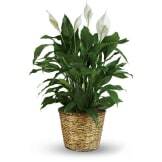 The Spathiphyllum, better known as the Peace Lily, is an enchanting 6" live plant in a heritage urn. 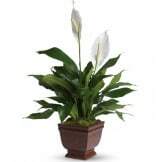 With its glossy, graceful leaves and stunning white flowers, this plant is a long-lasting and wonderful way to share your thoughts of love and sympathy. 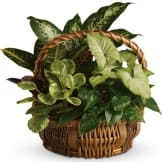 • This potted plant will be delivered in an urn, with moss around the base. • Measures approximately 23" W X 32" H.
Flowers will be received by a Lentz Funeral Home's staff. All of our flowers are designed and delivered by hand from a local florist in in Algona.